We enjoy welcoming back these wonderful ladies year after year for a fun filled scrap booking weekend. They have been coming for years and it is always fantastic! Join us for a fun filled weekend full of scrap booking, socializing, eating, and just enjoying each others company! A wonderful weekend get away! 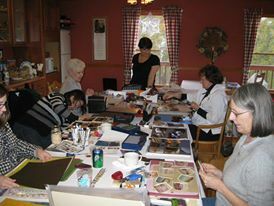 If you enjoy scrap booking come join us we know you will be back year after year!